A few steps forward, a few steps back for the Latin American McDonald's franchisee. Shares of Arcos Dorados Holdings, Inc. (NYSE:ARCO) fell 11.4% in August, according to data provided by S&P Global Market Intelligence. The Latin American McDonald's Corporation (NYSE:MCD) franchisee reversed course after nearly five months of steady stock appreciation. Arcos has struggled to maintain positive earnings growth as economic growth in Latin America has stalled. Revenue concentrations in high-inflation countries like Brazil, Argentina, and especially Venezuela, have hampered recent results, which are reported in U.S. dollars. It's not evident from this chart, but Arcos' second quarter contained some encouraging signs for investors -- with a few caveats. Net income of $43.4 million marked the highest quarterly profit the company has produced since 2013. And while revenue declined by 9.4%, to $687.3 million, due to foreign currency translation, the top-line improved by 7.9% on a constant-currency basis. Comparable sales increased 9.5% versus Q2 2015, again indicating that Arcos' potential is under the restraint of the mighty U.S. dollar. Yet despite these road markers of progress and shareholders' general relief in 2016 as the company has made progress reducing its outsized debt load, many challenges remain. In the organization's Q2 2016 earnings report, management disclosed that Arcos endured a second-consecutive quarter of remaining outside of two stipulated covenants under its master franchise agreement (MFA) with McDonald's. Arcos' MFA requires it to maintain a fixed-charge coverage ratio of 1.50 times and a maximum leverage ratio of 4.25 times. These ratios provide information about the company's solvency -- i.e. its ability to cover its long-term obligations. At the end of the reporting period on June 30th, Arcos held a fixed-charge coverage ratio of 1.64 times, and a leverage ratio of 4.40 times. These numbers aren't dramatically far from McDonald's' requirements and they're slightly improved from the previous quarter. McDonald's has granted waivers in both quarters and is likely to continue to do so as long as Arcos keeps making progress on its debt reduction. Still, shareholders are rightfully squeamish about possible effects should McDonald's decide to enforce its rights due to the non-compliance. At worst, the remedies include stepping in and acquiring the business in part or whole should McDonald's deem it necessary. 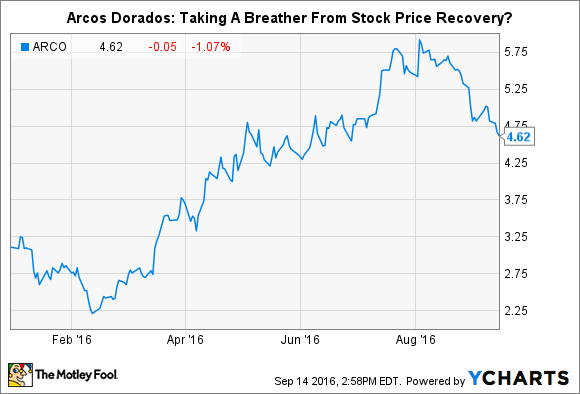 Arcos Dorados remains a problematic stock characterized by flashes of potential. In addition to higher earnings, an asset monetization plan intended to help retire debt and provide some operational breathing room is slowly burnishing the company's prospects going forward. But investors should exercise a healthy amount of caution, and even skepticism, until the balance sheet improves a bit more, and revenue in U.S. dollar terms begins to rise again.